First bands announced – more highlights will follow! Germany/ Oberhausen – The RUHRPOTT METAL MEETING, which takes place 07. & 08.12.2018 for the 4th time, announced first bands! 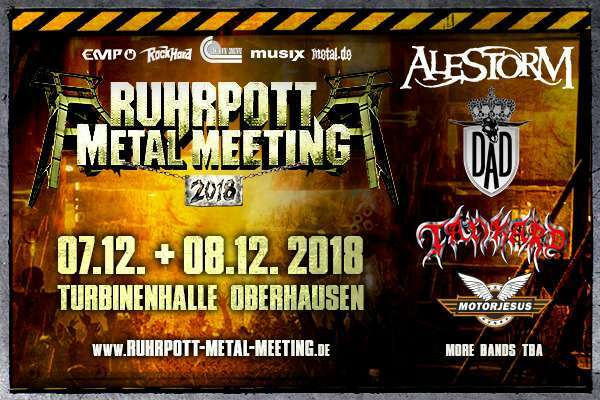 The “Ruhrpott Metal Meeting” will take place at the heart of the Ruhr Area on the 7th and 8th of December 2018 once again! Which place could be more suitable as the ,Turbinenhalle’ in Oberhausen, which was used for the steel industry in former times? The first bands we can announce hereby for the 2018 edition are ALESTORM, D-A-D, TANKARD and MOTORJESUS. ALESTORM are marching under their flag of “True Scottish Pirate Metal” and are accompanied by the Danish guys from D-A-D, which are one of the craziest live-acts on the globe! German Thrash Metal veterans TANKARD are famous for their beerdrinking-attitude and will make sure, that no one will leave the venue sober, while the heavy rockers from MOTORJESUS will turn the place upside down! Next to music, beer is best! We’re looking forward to you! For two days, the Oberhausen “Turbinenhalle” will once again host the largest indoor metal festival in the region.